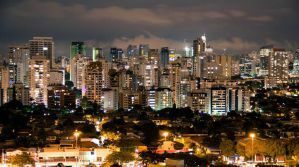 With a population of 11 million (almost 20 million in the metropolitan area) Sao Paulo is the largest city in Brazil. It is also a haven for culture and nightlife in the country. The city is often overshadowed by Rio de Janeiro as a tourist destination in Brazil, but it actually has a lot to offer visitors. There are many great restaurants, museums, and a wide variety of attractions around the city. If you're looking for a comfortable hostel that will let you enjoy a good nights sleep then the options below are good. There are plenty of hostels in the city, and you should have no trouble finding a place you are comfortable. 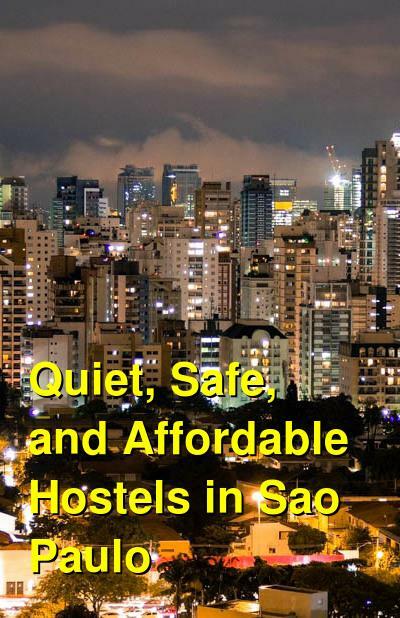 How much do hostels in Sao Paulo cost? A good hostel for students, backpackers, and groups of travelers. Sao Paulo Lodge is a good option for all types of travelers. Whether you're a backpacker, student, or traveling with friends, this is a relaxing and comfortable place to stay. The hostel has a welcoming atmosphere and it feels a bit like a boutique hotel. The rooms are large with lots of light. There are dorms that sleep six or eight people and their are female only and co-ed rooms available. The hostel is conveniently located close to lots of the city's top attractions. It's also close to some popular commercial areas and public transportation is easily accessible. If you're looking for a safe and affordable place to stay in Sao Paulo, this is a good option. A good hostel for backpackers and young travelers. Vila Rock Hostel is another good option for budget travelers to Sao Paulo. The hostel opened in 2012 and it's a relaxing and friendly place to stay. It's located in a large house that has been renovated to have everything that a traveler might need. There are both dorms and private rooms available. Private rooms are doubles and dorms sleep four, eight, or twenty people. The hostel has a bar on-site that has a relaxing setting. It's an easy place to meet other travelers and there's a pool table and a terrace area where you can enjoy views of the city. There's also a television room with comfortable sofas and chairs. This is a fun and laid back hostel, but it also offers a quiet enough environment that you can enjoy a good nights sleep. There's a youthful vibe and it appeals specifically to backpackers and young travelers. A good hostel for backpackers, female travellers, and small groups of friends. Brazilodge Hostel is a comfortable and secure place to stay in Sao Paulo, Brazil. It has the modern furnishings and standards of a hotel with the social atmosphere and relaxed setting of a hostel. The hostel is conveniently located near the Ibirapuera Park and Paulista Avenue Subway. There are both private rooms and dorms to choose from. Private rooms include twins, doubles, and three or four bed rooms. The dorms sleep either four or eight people and are split by gender. The building is very safe and secure and the staff are helpful and friendly. They work hard to make sure all guests are respectful of each other and the hostel remains welcoming and fun but also quiet and peaceful. A good hostel for couples, backpackers, and small groups of friends. Lobo Urban Stay is a quaint hostel that is located in a safe and traditional neighborhood in Sao Paulo. It's in the area of Jardins and is just three blocks from Paulita Avenue, where you'll find many different shopping and dining options. The hostel is also close to the subway, several bus stops, and a bicycle rental station. Nearby you'll find many great restaurants, shops, banks, and more. The hostel has private rooms with double beds and dorms that sleep up to eight people. The private rooms are well furnished with a bedside table, a large wardrobe, and several places to sit. The dorms have bunk beds, security lockers, and a balcony. This is a clean and comfortable place to stay. There is quiet time between the hours of 11 pm and 10 am so it is possible to enjoy a good night's sleep.